Jump on Hanmer Springs Attractions’ Jet Boat ride for a thrilling trip along the Waiau Gorge. With plenty of bumps and spins (plus some interesting facts about the river) the whole family will have ear-to-ear grins when the ride ends. One child goes free per paying adult for the school holidays: enter the promo code KIDSGOFREE at the checkout when booking online to get a free child ticket. 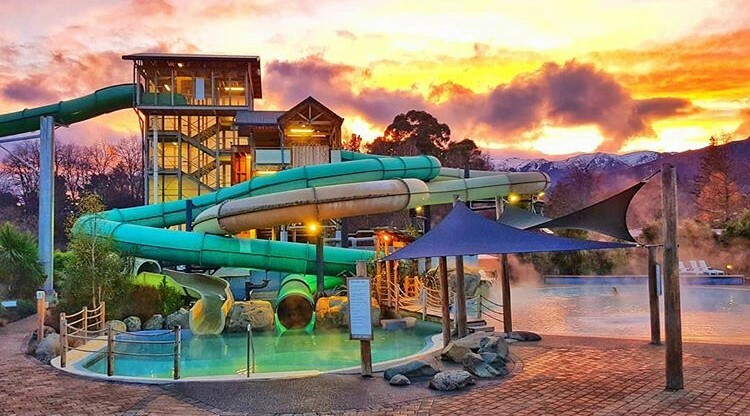 Hanmer Springs Attractions also offers bungy jumping, quad biking, rafting, canoeing, paintballing and clay bird shooting, all of which are lots of fun! With lots of farmyard favourites like sheep, alpacas, donkeys and goats (plus Tibetan yak and wallabies) Hanmer Springs Animal Park is a great choice for families to explore. Grab lunch at the café onsite or bring along your own picnic. A trip to Hanmer Springs wouldn’t be complete without a soak in the hot pools. With hydroslides, SuperBowl ride and childrens’ play areas there is plenty to keep the kids entertained while the adults relax in the thermal pools. The Tea Kiosk and Grill onsite also makes fantastic wood-fired pizzas for lunch or dinner. For plenty of family fun in the centre of the village, grab a game of mini golf or hire one of the cruiser bikes: seating 2-6 people, they are a fun way to discover the village with a decent bit of pedalling. There are loads of walking and biking tracks in Hanmer Springs, so it’s well worth bringing along your cycles! Walking the zigzagging track up Conical Hill is a must, and venture over to the forest area for plenty more walking and biking track options that are well worth doing.